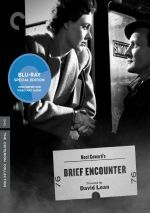 When I saw Criterion's release of Brief Encounter on the schedule back in 2000, I decided to review it because the film was directed by David Lean. Frankly, I then knew more about Sizzlean than I did about David Lean, so I welcomed the chance to witness additional examples of his work. As I mentioned, the focus of Encounter remains very narrow, as it concentrates almost exclusively on a short but passionate extramarital relationship. By happenstance, housewife Laura (Celia Johnson) and doctor Alec (Trevor Howard) meet as they wait for their respective trains, and from there they slowly embark upon their few weeks of love. Encounter adapted a Noel Coward short play called Still Life. Apparently that production only lasted about half an hour, so the movie needed some extra material to stretch to a still short 86 minutes. Although there's little in Encounter that seems readily identifiable as "padding", I do feel that it drags for too long, and that's not a good thing in such a brief film. There's simply not a lot happening here, and I don't find the characters compelling enough to carry me along for the ride. Both Howard and Johnson are very good in the parts, and they definitely help keep me mildly interested, but the plainness and predictability of the story makes me weary of the whole thing long before it ends. Brief Encounter isn't a bad film, and it has a few moments that work pretty well. Unfortunately, there are too few of these moments to help sustain my interest. Plain and simple, stories of this sort aren't my cup of tea, and it seems likely that fans of the "women's film" genre will get more out of it than I did. However, don't expect a whole lot from it, as the substance simply isn't there. Brief Encounter appears in an aspect ratio of approximately 1.37:1 on this Blu-ray Disc. The movie offered a strong transfer. Blacks demonstrated nice depth and richness, and shadows were also well-rendered. Low-light shots offered good clarity, and contrast seemed fine, as the movie came with an appealing silver sheen. Source flaws appeared absent, and the movie delivered a good layer of grain. Overall, this seemed like a highly satisfying presentation. As for the film’s PCM monaural soundtrack, it has held up well over the decades. Speech came across with a fairly natural sense and good intelligibility; any reediness or edginess failed to mar the proceedings. A few examples of iffy looping occur – during exteriors, mostly – but the lines still sounded fine. Effects weren’t a major consideration in this chatty flick – moving trains offered the most prominent element – but they sounded fine. While the effects lacked much depth, they were acceptably clear and lacked distortion. How did the Blu-ray compare to the Criterion DVD from 2012? Audio was similar, as there wasn’t a lot that could be done with 70-year-old stems. However, visuals showed a nice boost, as the Blu-ray seemed better defined and cleaner. The Blu-ray includes the same extras as the 2012 DVD. We get the film’s trailer and an audio commentary from film historian Bruce Eder. He provides a running, screen-specific discussion of the source material and its adaptation, story and character areas, crew, cast and performances, music and sound design, visuals and cinematography, sets and locations, and the film's reception. To learn more about Noel Coward, we go to an Interview with Author Barry Day. This runs 16 minutes, 21 seconds and features info about the source play and its adaptation, themes and interpretation, cast and performances, and a few other areas. Day repeats some of the info from the commentary, but he still delivers a brisk, interesting encapsulation of the various subjects. Next comes a 24-minute, 32-second featurette called A Profile of Brief Encounter. It offers notes from screenwriter/producer Ronald Neame, actress Margaret Barton, actress Celia Johnson’s daughter Kate Fleming, Noel Coward biographer Sheridan Morley, producer Sir Anthony Havelock-Allan, and actor John Sessions. “Profile” examines the original play and its adaptation to the screen, cast and performances, and the film’s reception. As was the case with the Day interview, inevitable repetition occurs here, but it’s nice to hear from some first-hand participants, so we learn a few new details here. Lastly, we locate a 1971 documentary entitled David Lean: A Self-Portrait. This goes for 58 minutes, 24 seconds and delivers notes from Havelock-Allan, filmmaker David Lean, director of photography Freddie Young, screenwriter Robert Bolt, and producer Sam Spiegel. Though it does include those other folks, “Self-Portrait” usually concentrates on the comments from Lean himself. He quickly runs through the films he directed and we then hear about more general attitudes toward filmmaking and his career. Because “Self-Portrait” moves so quickly, it can’t deliver much depth, but it’s still worthwhile just to hear from Lean himself. Like all Criterion releases, this one comes with a booklet. The 12-page foldout comes with an essay from Lean biographer Kevin Brownlow. It’s not one of Criterion’s best booklets, but it adds value. Brief Encounter provides an early look at the career of David Lean, although one won't find any of the scope or grandeur of his later films here. Instead, Encounter remains a very small character piece that’s too mushy and sentimental for my liking. The Blu-ray provided solid picture and audio as well as a few informative supplements. This release represents the film well.